When it comes to establishing your brand and creating market awareness among customers, promotional calendars are one of the easiest and most affordable ways to do so. The superiority in design of these personalized calendars makes sure that your brand and logo will stay visible and prominent for a much longer time compared to print ads or other marketing schemes. Permanence and annual functionality are a couple of primary things to consider when thinking about the right kind of promotional merchandise to give away. This projects a sense of longevity in terms of brand awareness which is very important for all promotional items. If you want to gain a wider client base for your business, considering an ideal promotional item is the key. Calendars are among the most common yet highly successful promotional items chosen by most businesses because of their yearly functionality. All you need to spend is a small amount of money that will give you enough marketing advantage for a whole year. Businesses opting for promotional calendars are more noticeable because their brands are in constant display the whole year round. Apart from the brand, other vital information about the business such as its line of products, services and other key details like locations are included in the calendar. Like most of the common promotional merchandises available on the market, promotional calendars also come in various designs and styles. From Peel n Stick Calendars to Wall Calendars and Year at a Glance Calendars, there are tons of designs to choose from. This is perfect for different companies because they are able to choose the ideal style that best suits their businesses. 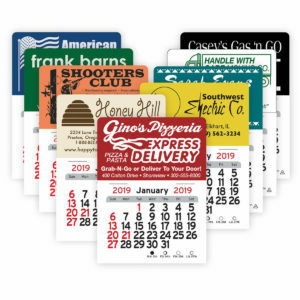 You can either send your promotional calendars to your customers through mail or offer them as store giveaways. You can also use it as a promotional giveaway at the next business function you attend. People receiving them are likely to display it in their offices or at home, giving you free advertising for the entire year. When you figure out the number of people who are going to see your promotional calendars all through the year, the total advertising cost your business incurs will just be pennies per diem. If you want to build your brand and increase awareness among your target market, promotional calendars is the perfect way to do this. When your calendars are up on the wall or on top of a desk, your brand will be on top of the minds of your customers.